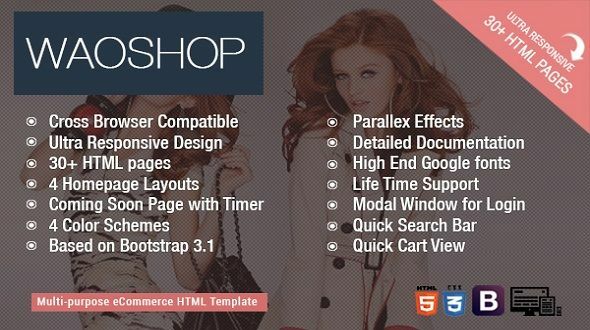 WAOSHOP is an excellent online store HTML template which is suitable to run all types of online stores. The fresh & ultra high definition graphics, super clean, modernand symmetrical design will give extra elegance and high popularity to your online platform. It’s coded keeping in mind most of widely used e-commerce platforms. The template consists of 30+ pages. It is Built with the latest versions of HTML5, CSS3, Bootstrap 3.1, it is also 100% responsive to give you a perfect display on all screen sizes. It is fully equipped with various widgets, components and prebuilt page variations which makes it perfect solution for those people who want to run online business. If you like the theme, please don’t forget rate it . It really helps me a lot, thank you very much!